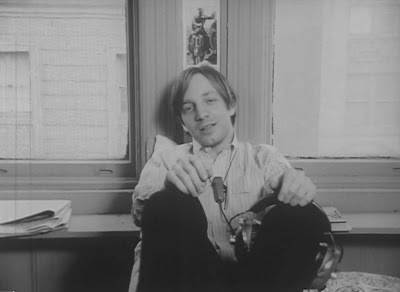 David Holzman's Diary (1967), by Jim McBride, is not a documentary -- an actor, L.M. Kit Carson, plays a filmmaker who decides to film his own life and who frequently speaks directly to the camera (top still). The film is a tremendously funny and prescient spoof of filmmaking and "one-man crew" shooting (in the second still, Holzman holds the camera on one shoulder; a portable reel-to-reel tape recorder hangs from his other shoulder). 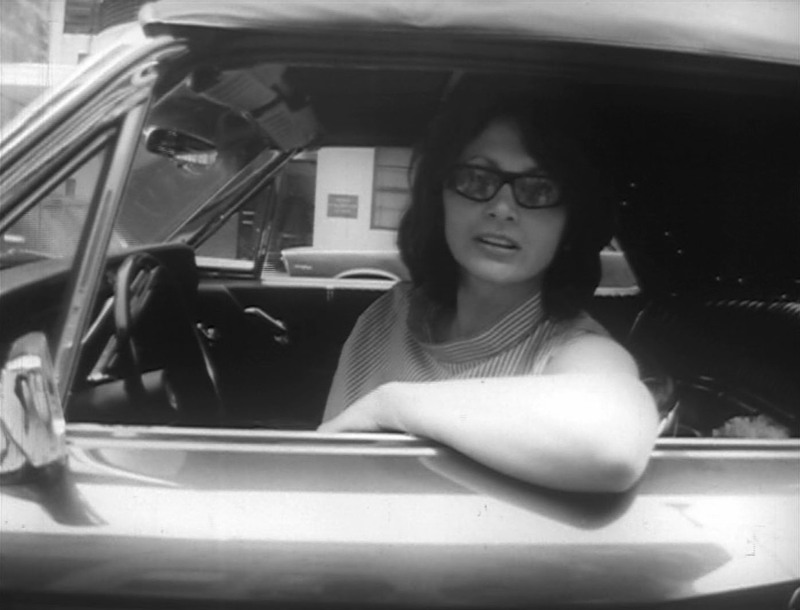 It anticipates the "skirt-chasing" genre (Ross McElwee's Sherman's March is another example) of documentary autobiography -- David Holzman's camera spies on, annoys, chases, and generally objectifies several women. 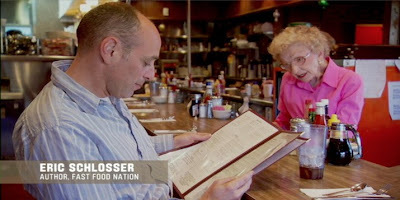 Robert Kenner's Food, Inc. (2008) is a completely absorbing and well-made film about our food: slow food, fast food, and horror-show food. 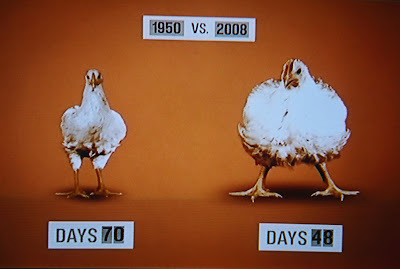 Why do Americans eat the things we do, and why is food controlled by certain corporations? 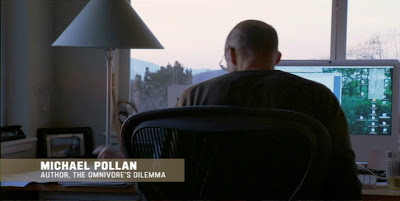 Eric Schlosser and Michael Pollan provide context; animations provide visual explanations (above). 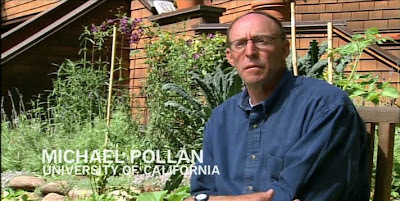 Multiple locations and a variety of voices are edited together to effectively hammer the film's points, so much so that Monsanto, for example, has (rather lame) responses posted on the web. King Corn (2007) covers the farm-to-plate problems of American food from the standpoint of two young men, Ian Cheney and Curt Ellis, who cultivate a mini-farm in Greene, Iowa. The film shows their year growing a one acre corn crop, interwoven with serious questions about subsidies, chemicals, and by-products of corn. 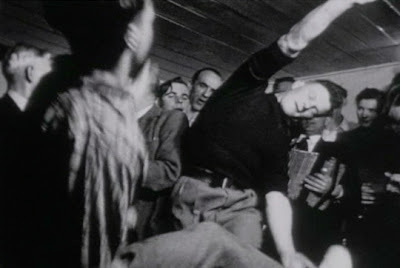 Animated sequences and Michael Pollan (above), among other elements, add to the well-told story. Mindy Faber's Delirium (1993) is an early experimental video autobiography. Hallmarks of this genre, including low-res visuals, "trading places" interviewing, parent-child dysfunction, and transgressive imagery, keep their freshness here. 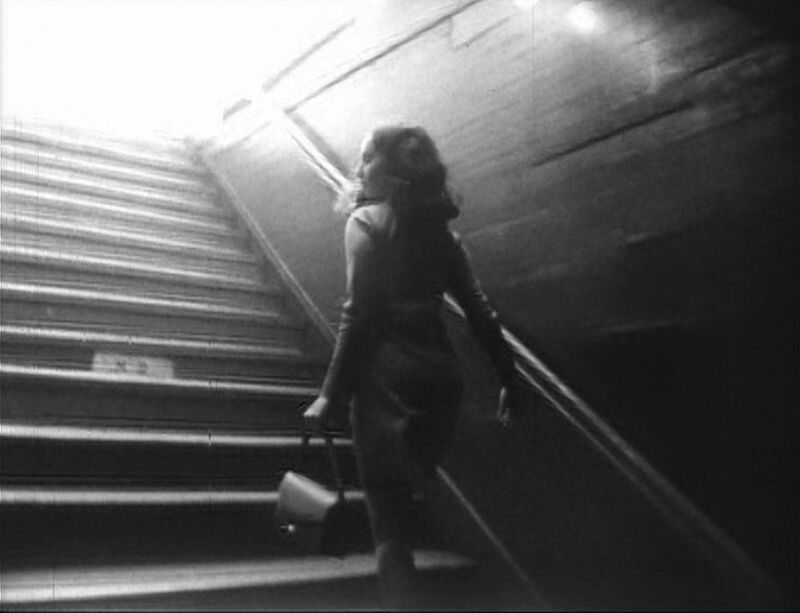 The film is a well-edited 23 minutes in length. 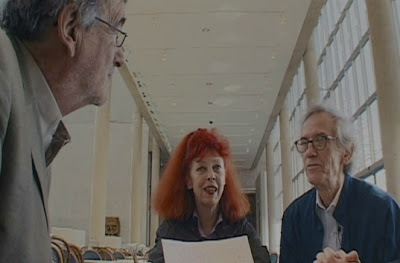 The Gates (2005), executive produced by Albert Maysles and directed by Maysles and Antonio Ferrera, is a sweeping tribute to the moxie and persistence of artists Christo and Jean-Claude. Jean-Claude's recent death brings The Gates to mind because of the film's warm and nuanced depiction of the husband-and-wife team through the years. 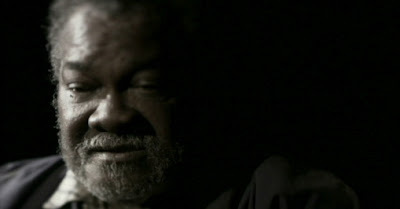 Outsider artist Purvis Young is the subject of Purvis of Overtown (2006), a film that suggests that the silly frenzy of the art gallery marketplace is purely a sideshow to Young's deep relationships within his home community in Miami. 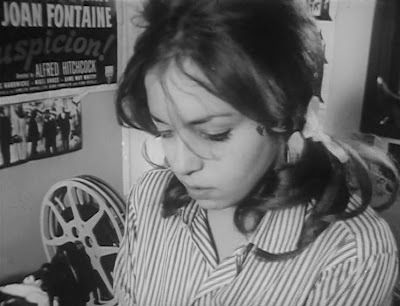 The film's contemplative shots of Young riding a bike (top still) are a visual answer to the sad sight of a freeway that slashes through the neighborhood. Update: This sensitive and informative obituary of Purvis Young is by Bruce Weber. 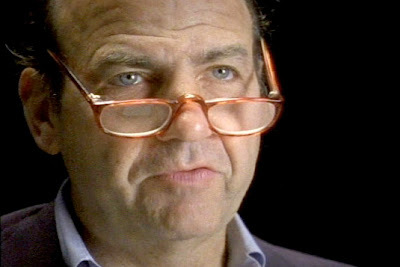 Elizabeth Barret's Stranger With A Camera (2000) shows the noxious effects of condescending outsiders documenting "the poor." 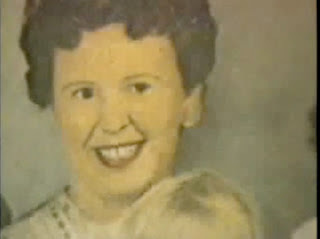 Barret does not try to explain away the cold-blooded murder, in 1967, of a filmmaker visiting Kentucky's coal country. But she cogently establishes the wrongheaded history of media misrepresentation of Appalachia. 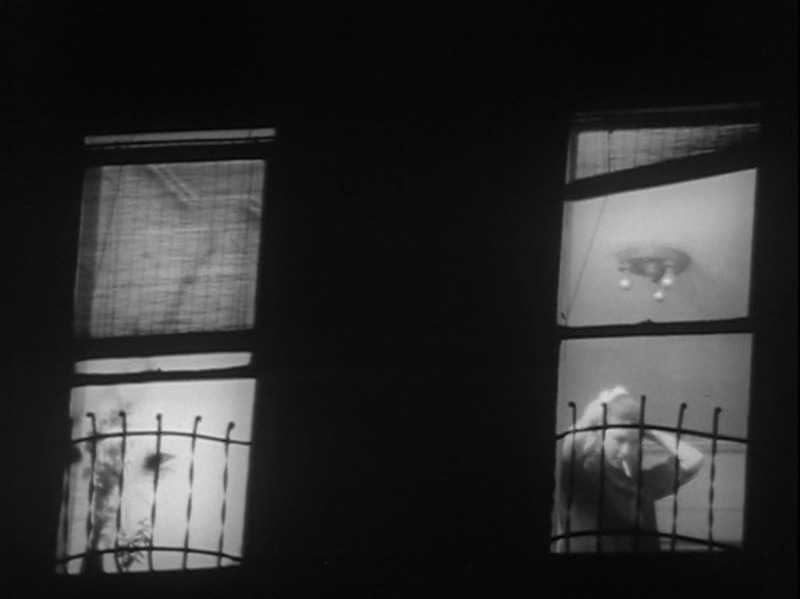 Mason Eldridge, an eyewitness to the murder, represents the passage of time (top and middle stills). Calvin Trillin (bottom) reads from his New Yorker article. 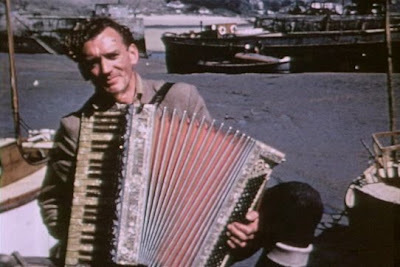 Oss Oss Wee Oss (1951-53), an early folklore film, documents the May Day traditions of Padstow, Cornwall. The script was by Alan Lomax, who also directed. Continuing interest in English traditional song and dance has maintained an audience for this otherwise very dated film and its many sequels. The May Day parade features a rather sinister-looking hobby horse costume and an old tune. 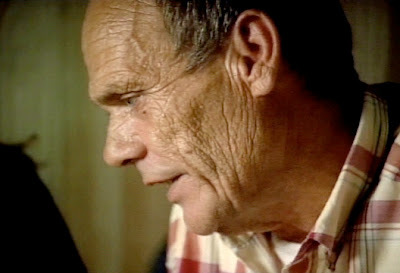 A Man Called Bee: Studying the Yanomamo (1974), by Timothy Asch and Napoleon Chagnon, is a classic ethnographic film done by anthropologists. The narration is didactic; the civilized-man-goes-native approach is outdated; the research in general is suspect. Ethnography has changed in the past 35 years, so much so that the film documents a discredited methodology even more than its apparent subject: kinship, myths, and customs of the Yanomamo. Kabul Transit, by David Edwards, Gregory Whitmore, and Maliha Zulfacar, has no narration and no formal interviews. 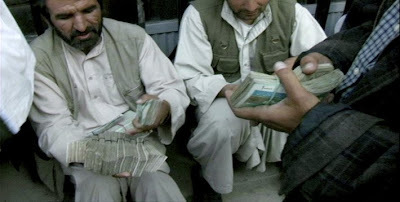 Scenes unfold, such as at the Kabul currency exchange (top still). 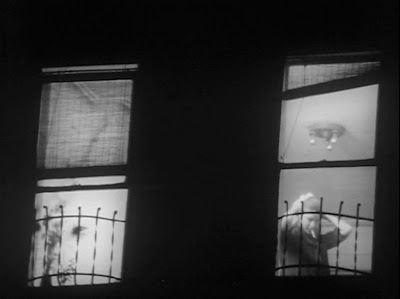 The filmmakers' point of view comes from framing and editing to create a a non-verbal, implied commentary. One official at a police station, for example, is framed with his fussy collection of pen stands prominently in the foreground. 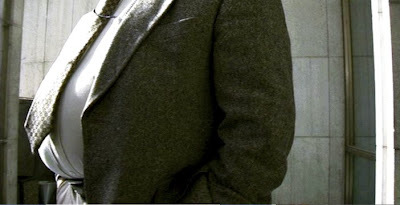 A headless American at a US facility is shown stomach-first. And a sequence showing old film reels dug up at the ruined Soviet Cultural Center implies that other outsiders have come and gone. 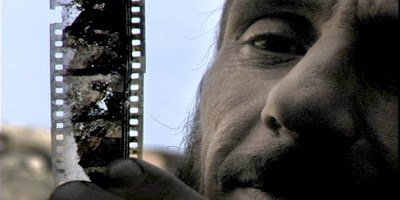 Avi Mograbi's How I learned to Overcome My Fear and Love Arik Sharon (1997) is a personal meditation on the difficulties of political filmmaking as well as a chronicle of the messy logistics of filming Ariel Sharon during the 1996 Israeli elections. We accompany the filmmaker at home and on the road, from comical phone negotiations to a series of political rallies and dinners. In the increasingly unreliable context of the film, a polarizing country parallels the strains within Mograbi's own marriage. A surreal coda, featuring Mograbi dancing and singing with some right-wingers, suggests that Mograbi has been playing a role throughout. 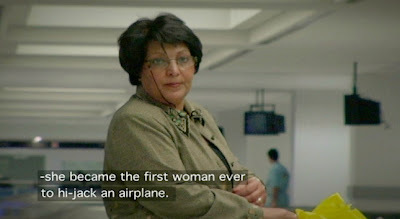 Leila Khaled: Hijacker (2005) by Lina Makboul captures attention in the first few minutes by establishing that a rather ordinary-looking woman (bottom still) was a hijacker in 1969. And she has no regrets. 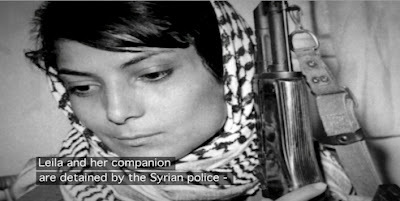 The young filmmaker (a Palestinian woman who grew up in Sweden) tries to figure out why Leila considers herself a freedom fighter rather than a terrorist. 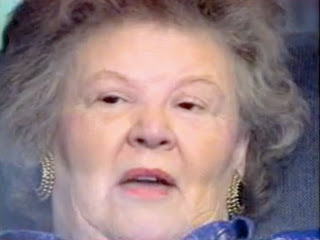 To Die in Jerusalem (2007) by Hilla Medalia centers on a video conference with two mothers of dead daughters attempting to have a talk. Four years after an 18 year old Palestinian suicide bomber (Ayat) killed herself and a 17 year old Israeli (Rachel), the filmmakers place their mothers virtually face to face, screen to screen. 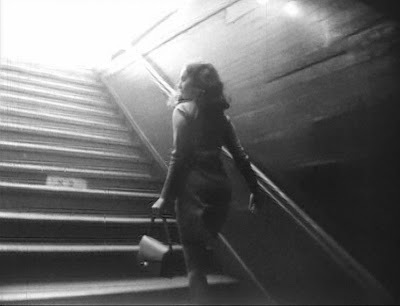 The resulting footage is emotional and raw. The arguing moms reveal some truths about the Israeli-Palestinian conflict but also create a disquiet based on the artificiality of their encounter. 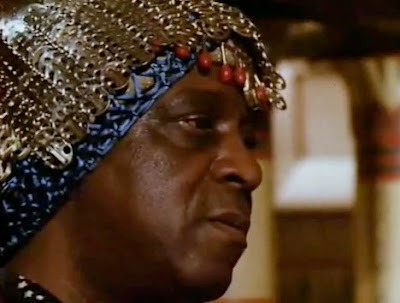 Robert Mugge's Sun Ra: A Joyful Noise (1980) features plenty of performance footage and philosophizing. Mugge's commitment to American music is heroic, long-lasting, and informed, as shown by this list of the documentary films he's made. Jean Bach's A Great Day in Harlem (1998) is a fond recollection of the making of Art Kane's 1958 photograph of dozens of jazz musicians. 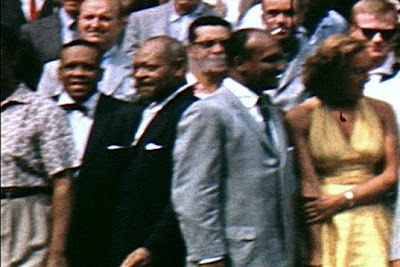 Top: Home movie footage of the gathering was taken by Milt Hinton's wife, Mona. 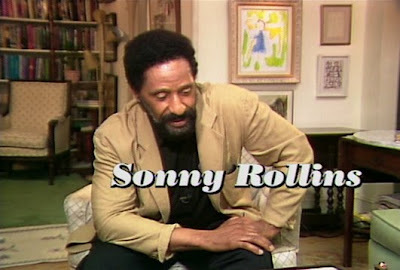 Middle: Sonny Rollins and many others provide insights and memories. 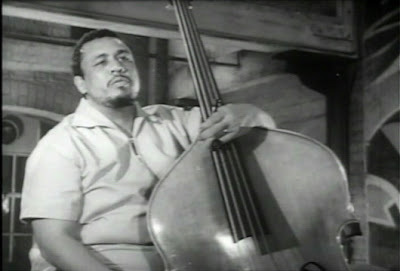 Bottom: Footage of Charles Mingus from the movie "All Night Long." 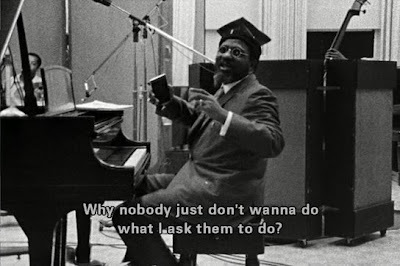 Thelonious Monk: Straight, No Chaser (1988) was made by Charlotte Zwerin with some executive producing help from Clint Eastwood. 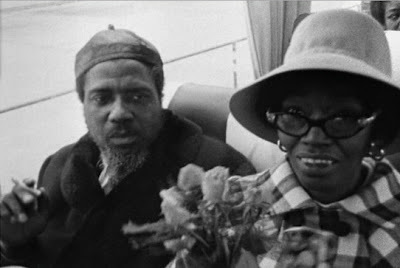 Astonishing black-and-white footage, shot by Christian Blackwood in 1967-68, was incorporated into a newer film after Monk's death in 1982. Performances and rehearsals (top still) amply document Monk's legacy and personality. 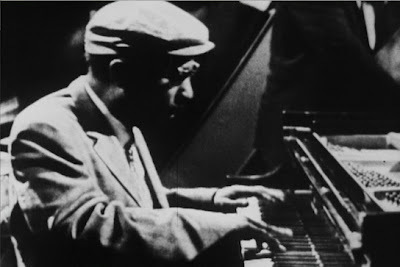 Zwerin emphasizes the innovation and triumph of Monk's music over his personal problems, rightly so. 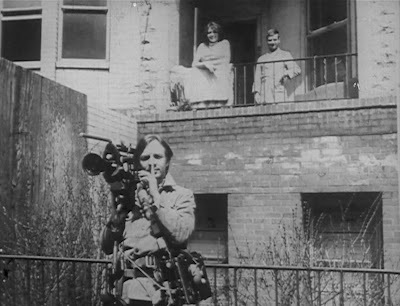 The film also shows the two women in Monk's life: his wife Nellie (middle still) and his friend the Baroness Pannonica Rothschild de Koenigswarter (bottom). 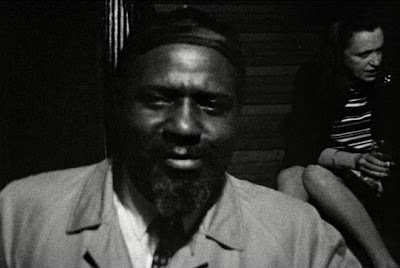 The December 8, 1957 CBS "Sound of Jazz" television broadcast brought many great jazz musicians together and contains several thrilling performances, including those by Thelonious Monk (above), Red Allen, Count Basie, Billie Holiday, and Jimmy Rushing. 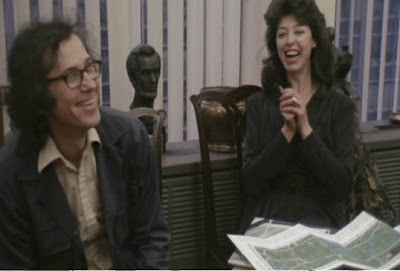 The show was organized by jazz critics Nat Hentoff and Whitney Balliett.